My first planting of green beans is finally ready. This year I opted for Haricot Vert. Thin pods with a soft vein and small beans makes for a tender, mild and delicious green bean. Plus, they are perfect for canning dilly beans. I am hoping to do some of those with my second planting. I plant about every two weeks until late fall so I can enjoy fresh green beans weekly. A quick stop at the Cheese Shop on Saturday for some smoked pancetta and I knew I couldn't pass up on one of my favorite summer dishes. Boil water in a 6 quart container. While you are waiting for water to boil, set aside a bowl with ice water. When water comes to a boil, add green beans and blanch, about 3 minutes. Quickly take off of heat, drain and add beans to ice water to stop cooking. In a medium saute pan over medium, cook pancetta until fat starts to render, about 3-5 minutes. 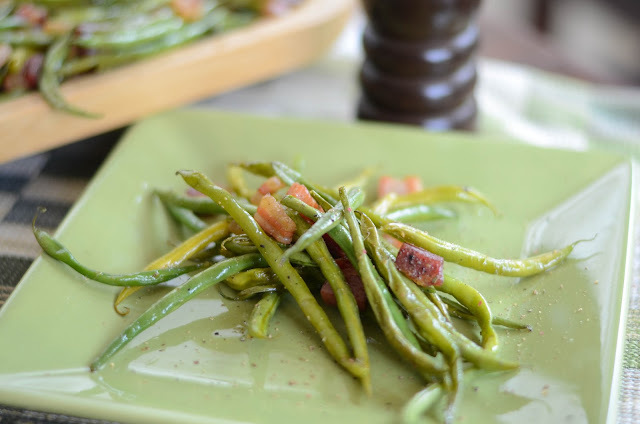 Drain cooled green beans and try to dry as best as possible. Add beans to pancetta and increase heat to medium high, cooking until the beans are tender, and pancetta turns golden brown, about 3-5 minutes. Remove and fold with freshly cracked pepper and lightly salt to taste.